Excerpted from the Environmental Impact Statement / Management Plan (pdf) . W.F. Cullings, who is believed to be the first white resident of the Thunder Bay region, began a fishing camp on Thunder Bay Island in 1835. Some evidence suggests that Cullings was an employee of the American Fur Company and had established himself on the island on the company's account rather than his own, but this is unclear. 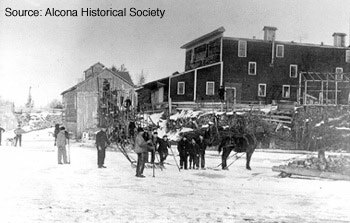 Later, a few buildings were constructed on the present site of the City of Alpena by hunters from Mackinaw; Walter Scott erected a fishhouse and trading post near these buildings. Great Lakes commercial fishing operation using mackinac boats, c. mid to late 1800s. This may resemble early operations on Thunder Bay Island. By the 1840s, both Thunder Bay Island and Sugar Island were used extensively for fishing operations. In 1846, Presque Isle and Thunder Bay fishing operations exported a total of 12,000 barrels of fish, equaling over 15% of the American and Canadian commercial fisheries of Lakes Huron, Michigan, and Superior. 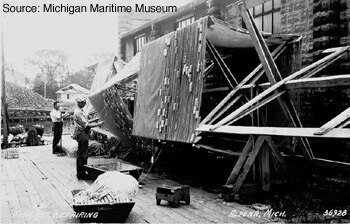 Fishermen repair gill nets in Alpena, c. 1940s. Lumbering, settlement, and port development all impacted the nearshore fisheries. River drives during the lumbering era damaged the river bottom; waste cuttings and sawdust covered the bottom and caused deoxygenation through decay processes. The draining of swamps, filling of shoreline areas, and dredging of navigation channels further diminished the nearshore aquatic habitat. By 1886, fish stocks in the area may have decreased by two-thirds, as witnessed by Williams, Plough, and Campbell, all of whom operated fisheries between Whitefish Point and North Point. 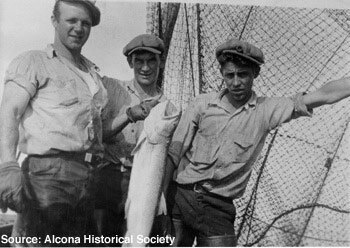 Gillnet fishermen with lake trout at Black River (south of Thunder Bay), c.1930s. The depletion of fish stocks led to the creation of a federal program for fish planting. In 1882, a United States fish hatchery was established in a building located on Water Street, east of First Street in Alpena. The hatchery was moved in 1928 to Park Place near the City Hall, and was closed in 1933 when its duties were transferred to other facilities. The extent of the Canadian and American Lake Huron commercial fisheries was estimated by Baldwin et al. (1979) to have declined from a maximum of 27,149 tons in 1889 (18.5% of Great Lakes fisheries production) to 5,226 tons in 1969 (4.2% of Great Lakes production). Although early documentation of fish catches were poor, Lake Huron provided up to 18.7% of Great Lakes production until the 1940s, when exotic species and overfishing contributed to a decline in Lake Huron fisheries production. Commercial fishing through the ice near Black River, c. 1930s. 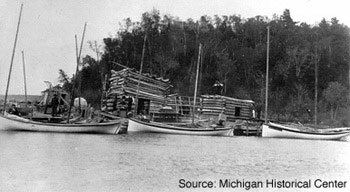 Based on information collected between 1919 and 1926, Thunder Bay was second only to Saginaw Bay in American fish production on Lake Huron. 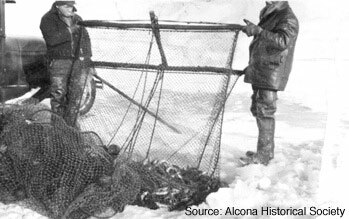 Gillnets were first used on Lake Huron at Alpena around 1835, and chub were first harvested there in 1902. Captain A.E. Persons asserted that he introduced the steam tug to the Great Lakes fisheries in 1875 at Alpena and revolutionized the entire industry. Fish harvested by firms with camps on the north shore of Thunder Bay, as well as at Crooked Island, Sugar Island, and Ossineke, were shipped to Detroit, Buffalo, or New York City. Commercial ice houses in Alpena shipped ice to Detroit, Toledo, and Cleveland. This industry was closely tied to commercial fishing because local firms such as the Alpena Fish Company used ice from the Thunder Bay River to preserve fish. Icemaking operations on the Thunder Bay River in Alpena. There are no known sailing or oar powered fishing vessels lost in the area, but at least two twentieth century steam fishtugs (the JEKA and the WILLIAM MAXWELL) and one motor vessel (J.N. DEWEY) are located nearby. Today, the primary groups using the Lake Huron fisheries are recreational anglers, Native American commercial fishers, and state licensed commercial fishers. The popularity of recreational fishing increased after the collapse of commercial fish stocks by the late 1940s. Opportunities for recreational fishing expanded in the late 1960s with the introduction of salmon in the Great Lakes. The decline in the economic impact of commercial fishing is illustrated by the decline in numbers of people employed in commercial fishing on the Great Lakes from a total of over 6,900 in 1930 to less than 1,200 in 1975. By comparison, about 2.8 million recreational anglers were active on the Great Lakes in 1975.